The Staunton Church of the Brethren offers a wide variety of educational opportunities for all ages. Sunday School meets from 10 to 10:45am. We also hold Vacation Bible School each summer. All caregivers complete a child protection training course through Virginia's Department of Social Services. Child care is provided for the 11am-12pm worship hour for newborns through age 4. All children are invited to participate in worship. Christian Education at Staunton Church of the Brethren begins with our youngest children! 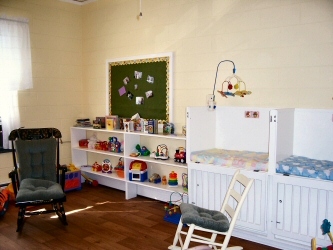 A nursery is provided for infants and children through age 2. Our infant nursery has recently been remodeled using no VOC paint and easy-clean flooring for optimal air quality and a healthy environment for our infants. Our paging system lets parents know that they’ll be called if their children need them. 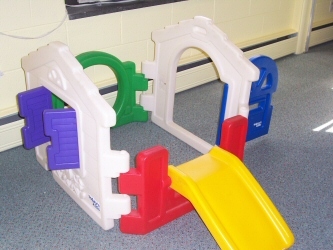 The Preschool Class is for children ages 2-5. Our preschool play room is available during worship for children ages 2 to 4. 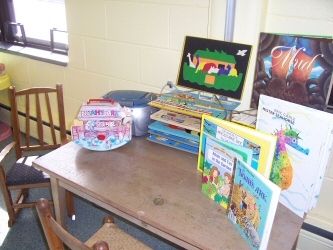 This is a safe, creative place where children can explore and play. 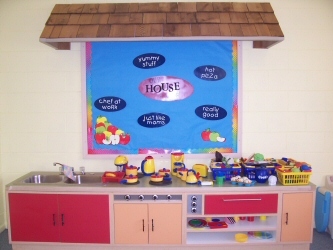 A favorite spot for the children is our play house area, where appliances, dishes, and play food invite children to cook and create. Children can participate in a variety of activities and learn at the same time! 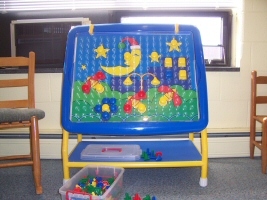 Activities such as our pegboard teach colors, shapes and promote fine motor skills. 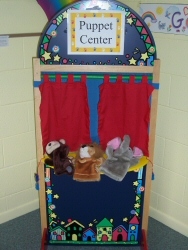 Books and our puppet theater encourage verbal skills. Of course, there are plenty of activities for active play too! Our paging system lets parents know that they’ll be called if their children need them. Children ages 5 to 11 enjoy our Multi-Age Sunday School class, where they learn a great deal from activities the leaders coordinate, and from one another. Visit the Youth page for more information on our Junior High and Senior High groups! Adults are encouraged to attend any Sunday School class, and to switch classes if there is a topic which appeals to them. Young Seekers is a Sunday School class for young adults of the church; a place to talk about faith, life, work, family, and more. Faith and Film started out examining Christian themes and issues manifest in current and popular films. They have since gone on to explore other topics, but kept the name. Discussion often revolves around scripture and areas of social concern and current events. Faith Connections is a Bible study connecting God's word with our every day lives and faith. The Sunshine Class uses guides for biblical studies that address new themes each quarter.